Adding to the rumours about the couple getting back together, Justin Bieber and Selena Gomez were spotted zipping around on Segways in California. Oh, this is just too good. 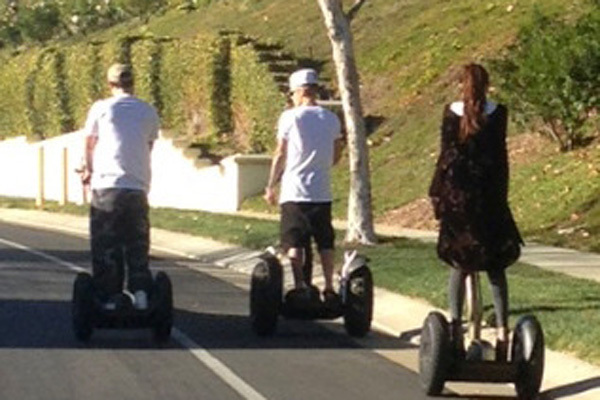 As rumours of yet another reunion are heating up, Justin Bieber and Selena Gomez were spotted riding around on Segways in the neighbourhood of Calabasas, California. If Bieber’s behaviour is described accurately, it’d be pretty consistent with other claims of his lack of regard for other people. It’d also probably be more threatening to swear at someone when not riding a Segway… Neither Justin’s nor Selena’s reps have commented on the incident. There is also no confirmation on whether the two are back together, but they seem to at least be giving their friendship a go. We assume we’ll be seeing a lot more of them now since Gomez has cancelled the rest of her tour. For now, simply enjoy these amusing photos of them looking super tough on their Segways.